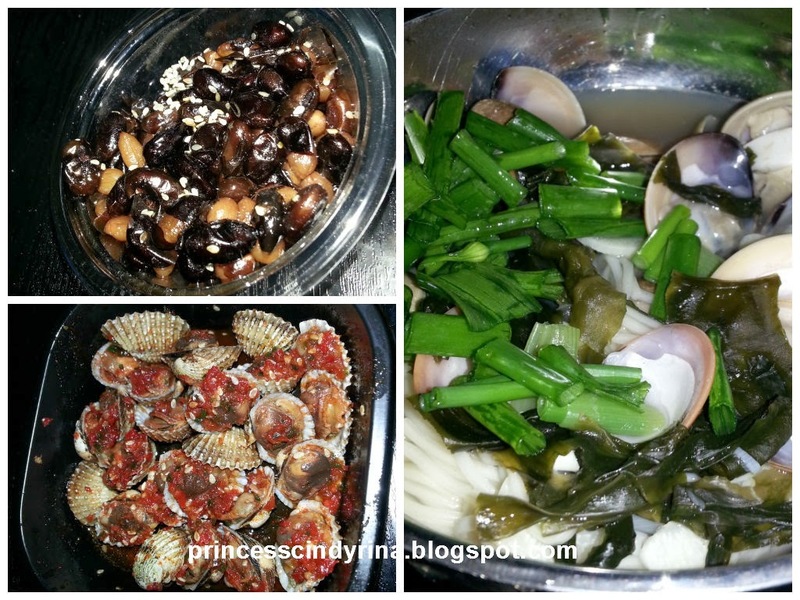 Great meal with my homemade hamaguri noodle soup and Korean side dishes spicy cockles and peanut&black bean in sesame. The feeling of eating these delicious food.....while watching my favorite Korean Variety Show...Oh My.....happiness to the max! I feel Bless and Thankful to God! Hamaguri Noodle Soup came about when I was trapped in heavy traffic jam. My office near KLCC area...so damn jam on Friday. I diverted myself to KLCC and gotten myself hamaguri...and I was singing sha la la la back home with high ambition to cook good dinner for myself. muakkkksss !!! love myself too much. Even my favourite radio station 88.1 also was on my side last night. I was driving back home with my favourite Canto rock band Beyond. Ahhhh...really make me miss Wong Ka Kui so much! Your song are the BEST EVER! Yeah...today's post will be all over the place and in mess.....whatever!!!! I have been neglecting my online diary for quite sometimes...IMA very busy study yo!! I just finished my final exam. Yup Yup this 39 years old still have that spirit to learn more and more. Hopefully will obtain my Certificate in Merger & Acquisition soon. Next Friday starting my class again for another Certificate. This Certificate really going to test my public speaking courage. Yup! I have that butterfly in my stomach feels if you ask me to talk in public. My MBA coursemate who remember me will agree to this. I look awful when I need to present something in front of class. Goshhhhh!!! embarrassing moment...I wanna forget all those memories. This time I really want to redeem those moment. I want to go through this course with full of confidence...at least before I reach 40 years old next year. God will help me as long as I try my best! Today is Saturday!!! I wanna have a good time before I have no life next week onwards! Beyond, I love their songs too! Beyond FOREVER! they are AWESOME!!!! !